At Eby Exteriors, we’re all about giving back to our customers and community — that’s why we’re sharing our comprehensive home roof inspection checklist. 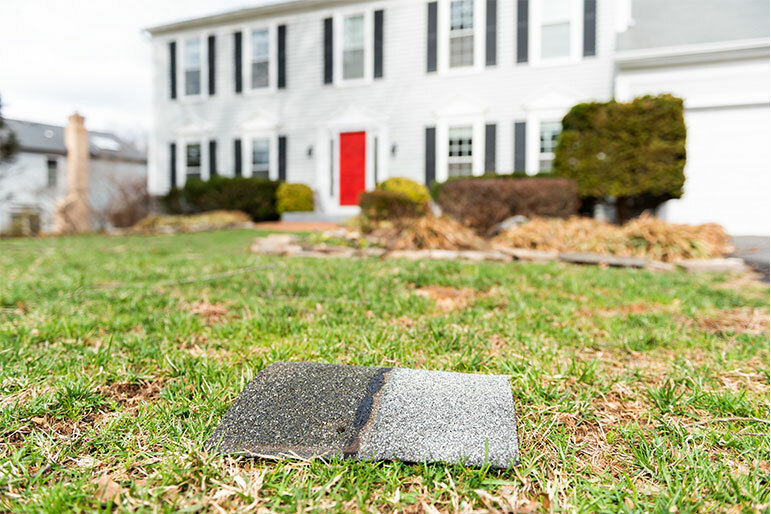 As a homeowner, you have the ability to learn about the health of your roof from the ground. The right know-how is all you need. Without stepping up on a ladder, without setting foot on your roof, you can perform a home roof inspection. Just follow along with our 9-point roof inspection checklist and you can feel confident that your roof is in good shape — or that it might need some repairs. At Eby Exteriors, we perform expert roof repairs and new roof installations correctly every time, offered at a fair price. While completing this roof inspection, if you discover you need a repair or replacement, contact us. Try to find areas where you can see shingles missing from your roof. The missing shingles will be pretty obvious and show through to the tar behind them. High winds are often responsible for tearing the shingles off your roof. Areas with missing shingles are prime spots for roof leaks that can cause damage to your roof and home. That’s why this is one of the first clues to look for on our home roof inspection checklist. 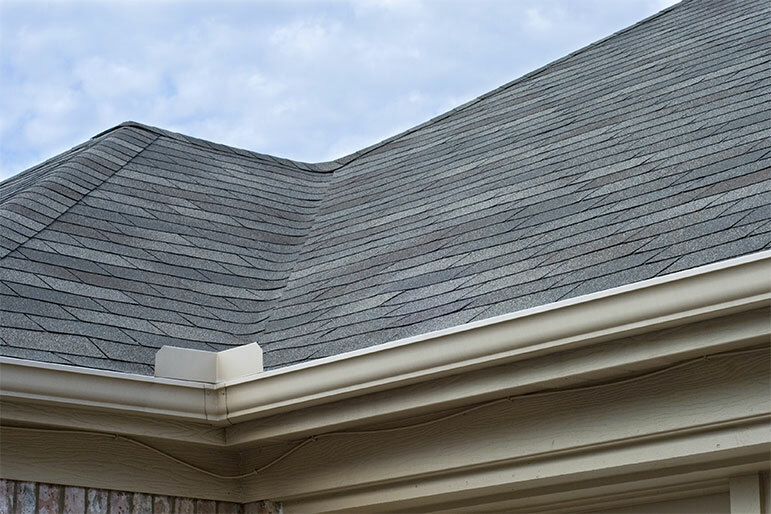 Often the stage before shingles go missing, if you see shingles partially standing, or standing up straight, it means they are attached on one side but no longer lying flat. Not only does this allow water to leak into your roof, but it also means that a stiff breeze will send them flying off your roof — and probably soon. Another sign of roof damage that you can see from the ground, curling usually happens when individual shingles dry out and become brittle. These brittle shingles no longer have the seal that keeps water out. If this is localized to just a few shingles, then you’ll only need to replace or patch those affected. The next step of your DIY roofing inspection takes you to the bottom of your downspout. When shingle grit and granules come loose, your roof starts to lose its powerful waterproof qualities. If you see the tell-tale build-up of shingle grit at the bottom of your downspout, you should start to worry that your roof might not stay waterproof very long. On another note, dislodged shingle debris is one of the main causes of clogged gutters and downspouts — learn more about our recommended gutter guards. An early warning sign that your roof might be damaged, if you see your shingles flapping in the breeze on a windy day, it’s not good. This means that the seal is gone and rainwater can start to seep down through the roof. Moss looks picturesque growing on an old stone wall, but if you see it on your roof during a DIY home roof inspection, it’s not such a pleasant sight. Over time, the moss will slowly but surely eat away at your roof’s surface while pulling moisture down into the roof and causing damage. The next step on our home roof inspection checklist takes you into your attic. You can actually see the warning signs of roof leaks and roof damage from the inside. Clues to look for include water stains, puddles on the attic floor, and even mold growth. Seeing something unusual in here means you need to get a professional set of eyes on your roof. If you have a room that lets you get an overhead look at a section of your roof, that’s the final step in your roof inspection. Use this interior vantage point to peek at the roof as a whole. You’re hunting for big cracks that span large sections of roof or areas of shingle discoloration. If you see any of these 9 signs that your roof needs some help, it’s time to call a roofing expert. Catching the issue early gives you the best chance for a repair, avoiding a total roof replacement. While high-quality, well-built roofs should last 25-30 years without an issue, poor materials or mishandled installation can leave new roofs leaking. Bottom line: if you see something wrong with your roof, don’t ignore it — no matter how new your roof is. If you notice any of the warning signs on our home roof inspection checklist, give us a call. At Eby Exteriors we offer FREE roof inspection for homeowners. Our experts will examine your roof top-to-bottom, looking for any issues. Whether you need a simple repair or a total roof replacement, we are the team to trust. Contact us to schedule your free professional roof inspection today. Schedule Your Free Professional Roof Inspection Today!